If you ever find yourself at a time when the attitude of gratitude is just not coming to you, come back to these reflections. 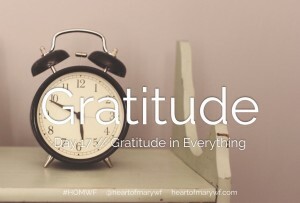 There is always a time to find gratitude, even after we acknowledge all the negative emotions that come into our lives. As strange as that sounds, we can even be happy during the times we also feel sad or angry or lonely. The happiness I’m talking about isn’t the excited, bounce-around-the-walls kind of happiness a five-year old has. It’s a softer kind, one rooted in hope for better things. It’s not as bright as the sun, but more like the soft glow of a beautiful star or a small fire. Hope comes to you when it doesn’t really make any sense to have it because that’s when you need it most. Through living with gratitude, we cultivate hope, which nurtures our faith and our love.